Wattcraft carried out an energy assessment for Sandroyd School in Wiltshire with a view to reducing its energy bills. This involved an initial survey of the school to investigate the potential for energy efficiency and renewable/low carbon energy measures as well as more economic ways of energy procurement. The results of the survey together with utility bills were analysed to ascertain the measures with the best technical and economic potential. The energy systems assessed by Wattcraft included biomass heating, wind energy, solar photovoltaics (PV), solar thermal heating, heat pumps, combined heat and power (CHP), energy efficient lighting, swimming pool insulation, wall and ceiling insulation and heating controls. Sandroyd School has started a practical programme of implementation of the recommended energy measures in accordance with its available capital and operational resources. Acting as the Client’s technical representative (Owner’s Engineer) in the project delivery phase. 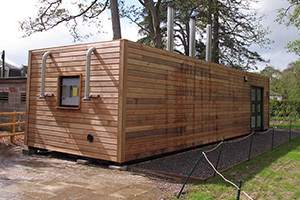 The energy centre contains 2 x 99kW biomass boilers and a back-up oil boiler.